It is the study of manipulating matter on an atomic and molecular scale. 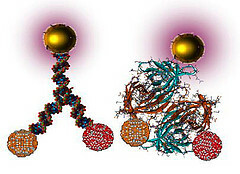 In a better way, it is powerful new technology which makes things which are useful for us on a nanoscale. You imagine the things in your room as a collection of atoms ,cells, molecules etc. Now if you want to create a different item you can select some of these atoms or cells to make it , like you make with building blocks. Nano technology is that stuff which make thing incredibly on small scale. Nano means billionth.That means a nano meter is one billionth of one meter. Zooming into each particle which is on earth may explain to us how science works with the atom, molecules and cells.That is what nano-science. Nano-scale helps us to do experiment on nano-science. Once we understand nano-science,we can apply the technology ie., nanotechnology. Because science is theory and technology is its application. Have you ever thought of it? How an apple cut apart turn brown after some time? Why Do You Have to Turn Off Electronic Devices on an Airplane? Have you ever thought of why you have to switch off the mobiles, Lap tops and tabs inside an airplane? We are warned that cellular service must be turned off because device transmissions interfere with the aircraft’s navigational equipment. But does this really happen? Can your cellular phone or other electronic device truly endanger the flight? The first step is knowing how your electronic device works and interacts with the airplane. Read the explanation for this. You may have heard that you can get water from a cactus if you are ever lost and dehydrated in a desert. Have You? Or is it a myth? Sounds like interesting?Read on..
Mauritia and Zealandia, were the two submerged continents and what the multinational team made up of South African, German, and Norwegian geologists and geophysicists have found about them. Explore youself.